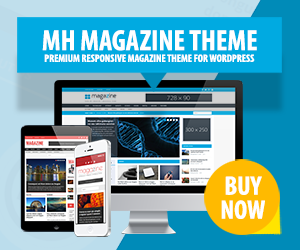 The MH Posts Lineup widget is included in our popular MH Magazine WordPress theme and has been designed to display one featured post with a list of additional posts. This nice custom widget is very flexible and thus suitable for full-width, 2/3 and 1/3 width widget areas. You can make use of the widget options and specify which posts to display by filtering posts by categories or tags. In this article we will help you use the MH Posts Lineup widget correctly on your website. You will learn more about the available widget options and learn how to display your articles by filtering posts while making use of categories or tags. In the available video tutorial you can see some examples of the MH Posts Lineup widget while it is being placed in different widget areas. To use the MH Posts Lineup widget on your website, you need to place the widget into your preferred widget area first. This custom widget is suitable for all available widget areas in MH Magazine. While using the widget options, you can adjust the content that is being shown, enter your widget title and, if needed, link the widget title to a specific location. To display posts from certain categories, you can select your preferred category by using the available drop-down menu. If you would like to display posts from more than one category, you can take advantage of the category ID filter and add a couple of category IDs to your selection. Multiple category IDs can be separated by commas (e.g. 12, 5, 23). In case you don’t know how to find the particular category ID, please see this tutorial: How to find the WordPress category ID. In addition, you may also filter posts by tags. Simply enter the tags you would like to filter in the provided field (separated by commas). The MH Posts Lineup widget also offers additional options you might want to use, e.g. skip a number of posts in the query, adjust the post order, limit the excerpt length and select the image size depending on the width of the particular widget area. Regarding the option to adjust the image size, there are two available settings: Normal and Large. When the MH Posts Lineup widget is placed within 1/3 or 2/3 width widget areas, please select Normal as image size. In case you’re using the MH Posts Lineup widget within full-width widget areas (e.g. Home 1 or Home 7), please always select Large for the Image Size option. In our video tutorial you can view 3 examples on how to use the MH Posts Lineup widget in different widget areas. The 1st example displays the widget within a full-width widget area spanning across the page, the 2nd example shows the widget within a 2/3 width widget area and the 3rd example shows what the MH Posts Lineup widget looks like within 1/3 width widget areas.